Once upon a time — basically since the dawn of time — people have implemented some pretty harsh methods and materials to tend to their bathroom routine, generally grabbing whatever was at hand to clean up. Dating as far back as ancient China and Greece up through Colonial America and right into the early 20th Century, our ancestors used stones, coconuts, shells, leaves, moss, grass, corncobs and sheep’s wool - none a very hygienic, or safe choice.. The fact that there was not a commercial product available for the sole purpose of wiping oneself is rather astounding. But leave it to good ol’ American marketing genius to turn something disposable into something indispensable. And with Aquinelle Toilet Tissue Mist, we’re doing our part to cut down on the modern day waste that is well… our waste, and to celebrate the advent of such a practical and necessary personal hygiene product. Because toilet paper is dry, we tend to use a lot more of it than we need to, and that means as a nation, Americans now use upward of seven billion rolls of toilet paper a year. Though more and more manufacturers are pitching in to help our planet by using recycled fibers and adjusting their manufacturing methods to conserve other natural resources, in the end, the amount of dry paper the average bathroom goer is using on any given occasion is about three to four times the amount necessary. Besides, wiping with dry toilet paper, quilted or not, is just not the most pleasing feeling. That’s why Aquinelle Toilet Tissue Mist can transform your dry toilet tissue into a refreshing cleansing experience with a few quick sprays. And unlike flushable wipes, these mists are good for you and good for the environment. They can do double duty as a room freshener and are an easy way to add the art of aromatherapy to your everyday bathroom business at home or on the go. Plus, they’re environmentally friendly, hypoallergenic, dermatologist tested, kid safe and available in six scents from exotic to energizing that will keep you feeling fresh. In 1857, a New York entrepreneur named Joseph Gayetty designed the first product specifically to wipe down there. A precursor to toilet tissue mist, perhaps not, but these aloe-infused sheets of manila hemp dispensed from a Kleenex-style box sound an awful lot like today’s flushable wipes. Gayetty even claimed his product prevented hemorrhoids and was so proud of his therapeutic bathroom paper that he had his name printed on each sheet. Unfortunately, as we are becoming more environmentally aware and knowledgeable about the overconsumption of wet wipes being flushed down our toilets, we’re discovering that sewage systems are becoming clogged and oceans are getting polluted. Additionally, marine life mistake the wet wipes for food, and are dying off as a result. 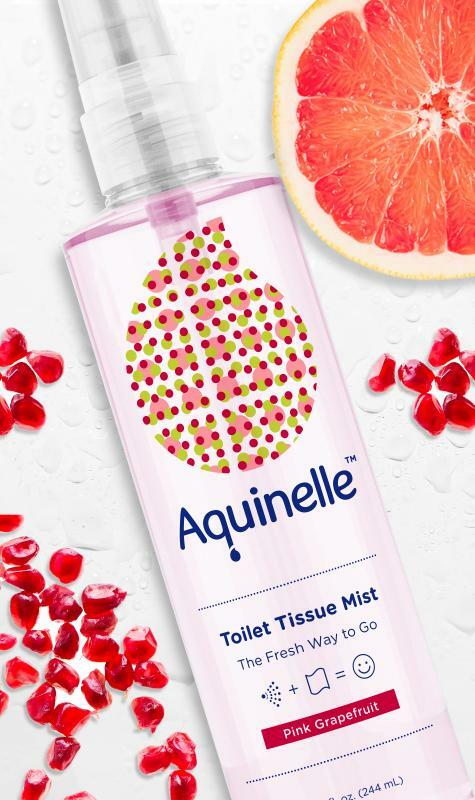 We’ve come a long, long way since those days and we believe using Aquinelle Toilet Tissue Mist on your toilet paper is just the beginning of new and better ways to tend to bathroom business with a nod to the environment and also to putting something natural back into a natural function. For more information, visit our shopping page.